It’s late at night, or early in the morning… hard to differentiate when you are in a Casino. They don’t have windows, they don’t have clocks, and they have a heck of a lot of security. Friday night slips into Saturday, April 27, 2002 and two groups of bikers are about to face off on the floor of the Harrah’s Casino. The Laughlin River Run is in full swing and bikers and citizens alike are enjoying the sights, sounds, and gambling of Laughlin, Nevada. The casino’s security cameras catch the action on the floor as gamblers scatter and run for cover. A fight has broken out between members of the Hells Angels and members of the Mongols. Hells Angels members Jeramie Bell, 27, and Robert Tumelty, 50 were both shot and killed. Stabbed to death was Mongols member Anthony Barrera, 43. Harrah’s attorneys had argued the casino wasn’t liable for the criminal acts of the bikers, including a “spontaneous and tragic biker club brawl” just after 2 a.m., as the melee was not foreseeable. However, a civil court jury seems to agree with Las Vegas attorney Brent Bryson and found for his clients, five bystanders who were caught up in the deadly brawl. Bryson said Harrah’s Laughlin officials knew trouble was brewing but did nothing to stop Hell’s Angels and Mongols motorcycle club members from clashing on the casino floor. “There had been information that an incident had been building between these two organizations and there had been a history of bad blood and feuding between these organizations, as well as the Hell’s Angels and a coalition of other outlaw biker gangs,” Bryson said. On Thursday, Bryson said he believed this is the first time the Laughlin casino, which is owned by Harrah’s Entertainment Inc., has been held responsible for failing to protect bystanders. Phil Sindlinger, one of the eight jurors, said the panel was deadlocked for most of its two hours of deliberations. In the end, he said, the vote was 6-2 for the plaintiffs. One of the plaintiffs, Michael Bower, claimed in the lawsuit he was caught in the crossfire between the Hell’s Angels and Mongols, with the bikers armed with guns, knives and other weapons. Bower said he badly injured his spine as he dove off his gaming chair to seek cover. He also said he experienced emotional trauma and flashbacks to combat during the Vietnam War. Bower had been suffering from posttraumatic stress disorder prior to the Laughlin incident and since then has been permanently disabled with posttraumatic stress disorder syndrome, a court filing said. 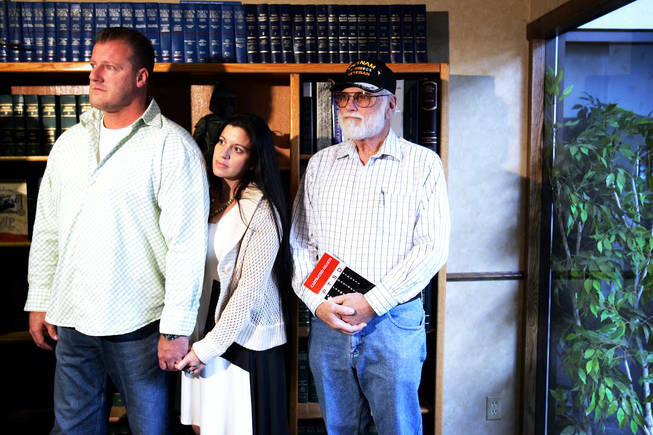 Plaintiffs Kathy and Steven Fuller, Goodyear, Ariz., weren’t at the press conference, but gave Bryson a written statement to read. “I believe it was a reasonable expectation and an expectation that most people would believe, that a resort hotel would provide a safe environment for its guests,” Fuller’s statement said. Papers filed with the court said the Fullers were gambling in the casino when they were engulfed by a stampede caused by the biker fight and at one point found themselves in an elevator with several Mongols armed with guns. Six members of the Hells Angels were sent to prison in 2006; charges against 36 others were dismissed. Frederick Donahue, a Hells Angel from Rodeo, Calif., vanished after indictments were handed down in 2002. He surrendered in 2008 and was sentenced to 30 months in prison. 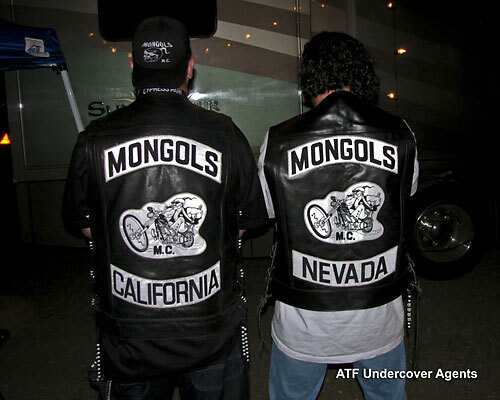 Six members of the Mongols motorcycle club were sentenced in 2007. The amount the 5 bystanders were awarded has not been disclosed. Last Monday federal prosecutors filed a motion in the Ramon Rivera v. Ronnie Carter etc. et al. civil case asking Judge Cooper to dismiss the Rivera suit. The motion asks for a hearing on December 14th. 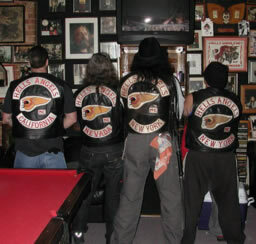 The government argues that Rivera’s suit should be dismissed on grounds that it is moot – which is to say that there is no longer an actual legal controversy between the government and unindicted members of the Mongols Motorcycle Club over whether they may or may not wear the club’s patch and top rocker. Throughout the 13 months of this case, the government has sought to criminalize membership in the motorcycle club: To in effect secure an unconstitutional Writ of Attainder against the Mongols Motorcycle Club. The government’s original strategy was to seize the name Mongols and the Mongols logo. As part of his plea deal, former Mongols President Ruben “Doc” Cavazos claimed he owned the Mongols trademarks and then gave them to the government. Federal police then proceeded to seize every piece of Mongols memorabilia they could locate. Rivera, who was not indicted, then enlisted the assistance of the San Diego office of the American Civil Liberties Union to make the government stop. Last July 31st, Judge Cooper ruled that the government could not seize the trademarks because Doc Cavazos said they could. Then Judge Cooper went on to explain that she would probably never allow the government to seize the Mongols marks. “At the June 22 hearing,” she wrote, “the Government revealed for the first time that the mark it sought to forfeit was a collective membership mark. Previously, in its Ex Parte Application for Post-Indictment Restraining Order, the Government (in this case ATF Case Agent John Ciccone) referred to the mark simply as a trademark, which was ‘purportedly for use in commerce in connection with promoting the interests of persons interested in the recreation of riding motorcycles.’ In contrast to commercial trademarks, which are used in commerce and generally not entitled to full First Amendment protections, collective membership marks are used by members of an organization to ‘indicate membership in a union, an association, or other organization.’ The use and display of collective membership marks therefore directly implicate the First Amendment’s right to freedom of association. The Supreme Court has recognized that ‘implicit in the right to engage in activities protected by the First Amendment’ is ‘a corresponding right to associate with others in pursuit of a wide variety of political, social, economic, educational, religious, and cultural ends.’ This right is crucial in preventing the majority from imposing its views on groups that would rather express other, perhaps unpopular, ideas.’ Furthermore, clothing identifying one’s association with an organization is generally considered expressive conduct entitled to First Amendment protection…. If speech is noncommercial in nature, it is entitled to full First Amendment protection, which prohibits the prior restraint and seizure of speech-related materials without a judicial determination that the speech is harmful, unprotected, or otherwise illegal. The government has been fighting the judge on this for the last three and a half months. Government prosecutors have blatantly stalled. They have accused the judge of “premature adjudication.” In the motion filed this week, the government makes two arguments, one old and one new. The old argument is that Rivera “lacks standing” because he was not indicted. What goes unsaid, of course, is that the court will still be there next April when the criminal trial is now scheduled to start. Judge Cooper, who has already told the government not to do what it wants to do, will only be in charge of that court until March 15th. And, maybe the new judge will agree with the government. The government still clearly intends to try to seize the Mongols name and patch. If that was not the case the government would not have filed its motion last Monday. Lots going on during Sturgis week and here is the third installment of the news that you may have missed and might be interested to know. Please note that not everything in this digest actually happened IN Sturgis… some of the news is from other happenings around the country, but if you were in Sturgis this year, you may have missed it. Through the first Saturday, the official start date of the rally, 261 citations had been issued in connection with the Sturgis event, compared to 239 citations issued at the same stage last year. This year’s citations included 45 DUI arrests, up from 40 by the same time last year, but only one felony drug arrest, down from ten. Eleven injury accidents had been recorded, compared with 10 at this point last year. Mongols MC member, Christopher Ablett, 36, plead not guilty July 29 in U.S. District Court in San Francisco to charges of murder in aid of racketeering and two gun-possession charges in the September slaying of Mark “Papa” Guardado, the head of the Hells Angels’ “Frisco” chapter. Ablett turned himself in to police in Oklahoma in October. He is being held without bail at a downtown Oakland jail and returns to court Aug. 12. $61,600 was the official amount that was raised by the Sturgis Lengends Ride. Again, proceeds go to charity (Black Hills Children’s Home and the Sturgis Motorcycle Hall of Fame and Museum). This is approximately a $21,000 increase over last year! Fantastic job gang. Rally attendance was down, as has been the case the past few years. Reports that vendor permits remained about the same have been made, which makes us think that at least the vendors have not yet given up… Still, plenty of people attend and I know a lot of folks who are more than happy to see attendance down as it makes the riding easier and less crowded. Main Street had a Sons of Anarchy mock clubhouse all set up for folks to walk through. The new season is starting soon and I am sure a lot of people are sitting on the edge of their seats to see what happens this go around. Drunken-driving arrests were up, and so were injury accidents this year at the Sturgis Motorcycle Rally. The annual rally officially concluded Friday, but many bikers come early or linger after rally week throughout the Black Hills. Through Saturday, there were 316 DUI arrests at this year’s rally compared with 253 last year, according to the state Highway Patrol. There were 72 injury accidents this year compared with 60 last year, the patrol said. But there were fewer arrests this year than last for offenses other than DUI. This year’s total was 199 misdemeanor drug and felony arrests. Last year’s total was 232. According to federal court documents, Ruben “Doc” Cavazos, past President of the Mongols Motorcycle Club, and several other members, have entered a guilty plea to one count of racketeering and faces a life prison sentence. That charge and several others are contained in a 177-page indictment filed against Cavazos and 78 other defendants. The federal case details a pattern of murder, attempted murder, drug dealing and racially motivated attacks. It also alleges that Cavazos sought to join an alliance with the Mexican Mafia to garner profits from trade in illegal drugs. Cavazos was arrested after a three-year undercover investigation ended in October of 2008. During a nationwide, federal sweep targeting members of the outlaw motorcycle club, authorities arrested 61 people in Southern California.